Home News Less Words, More Action: Where is Congress on RECLAIM and Black Lung? Less Words, More Action: Where is Congress on RECLAIM and Black Lung? It’s March and there has still been no progress by Congress to take action on two pieces of legislation that are critical to coal communities: an extension of the tax rate paid by coal companies that supports the Black Lung Disability Trust Fund and passage of the RECLAIM Act. The reason why both the black lung tax extension and RECLAIM are stalemated is the same: opposition from coal companies and the National Mining Association, which have used threats and misinformation to block legislative solutions, and to evade their responsibility for broken lives and polluted lands and waters. A recent Joint Committee on Taxation report showed that a black lung tax rate extension would raise $169 million in revenue in 2019 for the Black Lung Disability Trust Fund. 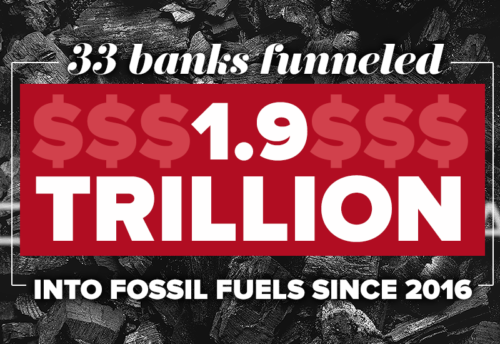 That means that Congress’ lack of action is effectively delivering a $3 million subsidy PER WEEK for the coal industry, at the expense of taxpayers. Sound familiar? We need fewer words and more action. Where are the elected congressional leaders in Appalachia and why are they not doing everything they can to hold the industry accountable to those impacted by the downturn of the coal industry? 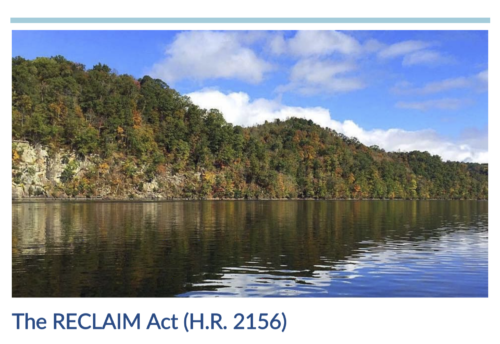 On Thursday, March 28 at 10:00am, the House Committee on Natural Resources will hold a hearing on innovative ideas for mine reclamation and redevelopment where the RECLAIM Act will be a big topic. The committee usually streams the hearing on their Facebook Live and invites the public to engage. We’re encouraging our members to participate in the discussion to show the committee how important and necessary mine cleanup is for our communities. If you live in the DC area, you can even attend the hearing! It will be held in the Longworth Building on Capitol Hill. Members of Congress will be home in their districts April 15-26 and May 27-31. This is prime time to set up meetings and demand they secure black lung benefits for retired miners and pass the RECLAIM Act. We’ve got materials ready to go from state-specific fact sheets to news articles and examples of model projects. If you haven’t already, join the National RECLAIM Working Group where we come together on the first Thursday of every month to build grassroots strategies that support local organizing and push forward the federal campaign. Contact info@theallianceforappalachia.org to get notified of upcoming calls. As we fight to remedy the damage done to our miners in the past, Congress also has an opportunity to build a positive future for communities impacted by coal’s legacy by passing the RECLAIM, legislation that’s long overdue. It commits $1 billion to projects in states that clean up abandoned coal mines and waters polluted by them, and that lay a foundation for future economic development and diversification in coal-impacted communities. Members of both parties have worked to strengthen RECLAIM since its introduction in February 2016, and members of the Alliance for Appalachia have been working on it even longer than that. Despite broad bipartisan support locally and federally, this bill has stalled in Congress. Nevertheless, we push onward. Alliance members traveled to Washington, D.C. last Fall to urge members of Congress to support a just transition for our communities, and we continue to build grassroots strategies with a coalition of partners across the country on monthly coalition calls. 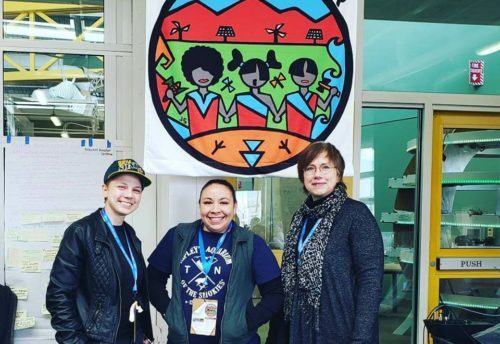 Members of the Alliance continue to build power locally and push for solutions rooted in justice. For example, Kentuckians for the Commonwealth published a report that demands action from Congress on RECLAIM, funding for the Black Lung Disability Trust Fund and protecting miners’ pension: Fixing What’s Broke. This Trust Fund is supported by a small excise tax paid by companies per ton on coal sold domestically, at a rate unchanged for more than three decades. But Congress failed to extend the tax rate before the end of 2018, and it has now been cut by more than half. This gift to the coal industry will create a long-term financial crisis for the Black Lung Disability Trust Fund unless it’s corrected. The Trust Fund is more important now than ever, not just because of the sharp resurgence of black lung among coal miners, but because a wave of bankruptcies in the coal industry is creating increased pressure. In 2017 alone, more than 2,500 black lung claims were transferred to the Trust Fund due to coal company bankruptcies. This safety net, meant to help alleviate the harm from black lung when coal companies go bankrupt, is itself in danger of insolvency. In early 2019, WV Senator Joe Manchin introduced the American Miners Act, which would secure miners pensions, and proposes a 10 year extension of the Black Lung Excise Tax we have been advocating for. Still, Congress has taken no action whatsoever on the legislation. Alliance member, Willie Dodson with Appalachian Voices talks more about cuts to funding for black lung benefits in this blog post.